March 1946 was the most momentous and happy month in my childhood in Bombay (now Mumbai). I was a teenager and eager to be involved in the celebrations of the 60th anniversary or the Diamond Jubilee of the Imamat of our beloved 48th Imam, Hazrat Imam Sir Sultan Mohamed Shah Aga Khan III in Mumbai. The proper day of the weighing of our Imam in diamonds was 10th March, 1946 at Brabourne Stadium. There were murids arriving from many places in the country and from abroad. I was a member of the Hasanabad Boys Scouts who were given regular duties to care for the visitors in camps in the grounds of Hasanabad and Aga Hall. There were camps in many other Jamatkhana grounds too. During the days preceding the main event there were jubilant programmes everywhere. To ensure all were happy and that visitors were being cared for, Mata Salamat Begum Om Habibah and Prince Sadruddin Aga Khan would arrive unannounced and join the helpers, as well as participate in the Rasda performance by all whenever they wished. Our hearts were leaping with joy on such days, but we were also mindful to see the camps were clean, the visitors fed and looked after. I was also fortunate to be a member of the Hasanabad Boys Scouts Orchestra and played harmonium. We practiced the geets written to celebrate the Jubilee, that have become so beloved. At his residence in Mumbai, Imam Sultan Muhammad Shah examines some of the diamonds before the day of the Diamond Jubilee Ceremony at Mumbai’s Brabourne Stadium. On 8th March, 1946 we were required to dress in our new uniform made of air force blue gabardine material and be at the gates of Hasanabad. Our orchestra was to be in the “white swan” float, which was part of a magnificent procession starting from Aga Hall on Nesbit Road. The other floats included representations of Alamut and the Al-Azhar mosque, both of which are extremely important in Ismaili history, and there were silver chariots with fairies strewing flowers as the procession progressed. There were elephants and horses mounted by leaders dressed in historical costumes. 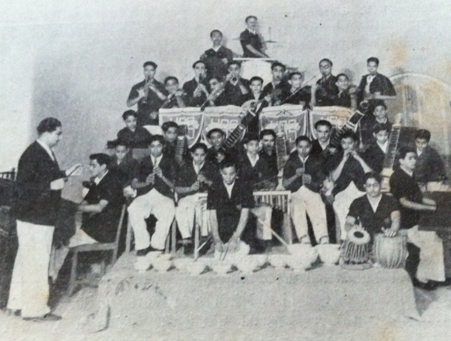 Karachi’s marching band with groups of adult volunteers called “Rovers” from a number of Jamats, marched slowly through the streets from Nesbit Road, via Mazagoan, Noorbaug, Dongri to Darkhana where the procession met Prince Aly Khan. Imam Sultan Muhammad Shah with Begum Om Habiba, Mata Salalmat, and Prince Sadruddin at a Mulaqat with the Karimabad Jamat during his Diamond Jubilee visit to Mumbai. Photo: Ilm magazine, London. Prince Aly Khan was resplendent in his British army uniform and very distinctive hat, beaming with joy and accepting the salute from all. The streets everywhere were lined by thousands of people waving “my flags” and clapping as they saw the procession approaching. From Darkhana, the procession progressed through Kandimohalla (later renamed Karimabad) Jamatkhana on to Mohamedali Road to the law courts. At the law courts we were unexpectedly blessed with the didar of Mawlana Hazar Imam who showered us with his blessings. Mata Salamat and Prince Sadruddin Aga Khan who were accompanying him waved and clapped happily. The procession terminated in Azad Maidan before dispersing, and we all went home to prepare for the next day of fireworks and illumination. Like other Jamatkhanas, Hasanabad was glittering in the dark with illumination covering the building and the domes. 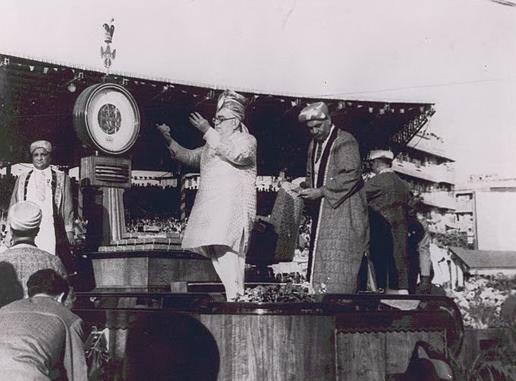 10 March 1946: His Highness the Aga Khan III shows his appreciation and blesses the crowd after he is weighed against diamonds at Mumbai’s Brabourne Stadium to mark his 60 years of Imamat. The diamonds that he was weighed against were worth 640,000 British pounds and the money was returned by the Imam for the community’s social uplifment programs. Photo Credit: Karim Jassani Collection. Thus with joyous hearts and tears in our eyes, we prepared for the final day on which the weighing ceremony using diamonds was performed at Brabourne Stadium. Our orchestra was positioned in a prominent position from where we could see it all. Ten years earlier, in January 1936, the Golden Jubilee of Hazrat Imam Sir Sultan Mohamed Shah Aga Khan III was celebrated in the grounds of Hasanabad, but I was too young to have any memories of that first of the worlds famous jubilees of His Highness the Aga Khan III. Hasanabad was built in the memory of his grandfather, our beloved 46th Imam Hazrat Imam Shah Hasanali Shah Mahalati, Aga Khan I, on a land acquired in Mazagaon in an area called Eden Hall, which the Imam chose and acquired on his visit to the area. He was the first Imam to move from Kirman in Iran, via Zerruk, Baluchistan, Afghanistan and Sindh to finally settle in India. 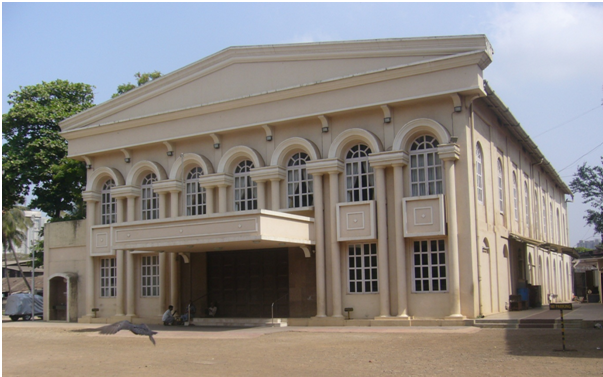 He established his residence at Aga Hall in Bombay in 1848. His Imamat was very eventful and the Jamat in India progressed rapidly and laid strong foundations in Mumbai and surrounding area. 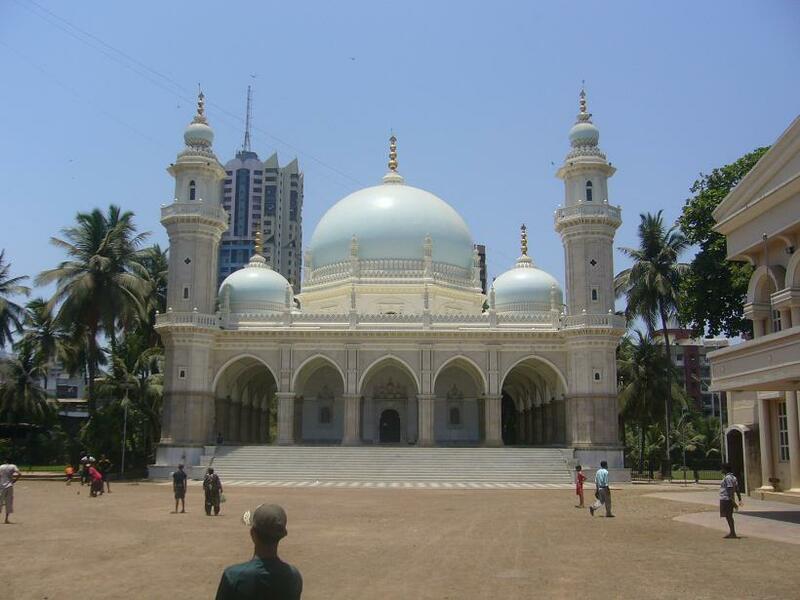 A recent photo of the mausoleum of Imam Shah Hasanali Shah, Aga Khan I, in Hasanabad, Mumbai. Photo Credit: Mr. Shaukat Chandani. He passed away on 12th April, 1881. The mausoleum in Hasanabad where he rests is built of sand stone and the finest white marble supplied from Iran. The architecture resembles the Taj Mahal, and has a pair of gates resplendent with hammered silver that open into a chamber where there are three tombs, one for the 46th Imam and another which was a temporary resting place for the body of the 47th Imam, Aga Ali Shah, Aga Khan II, before it was moved to Karbala for a permanent burial in Najaf. 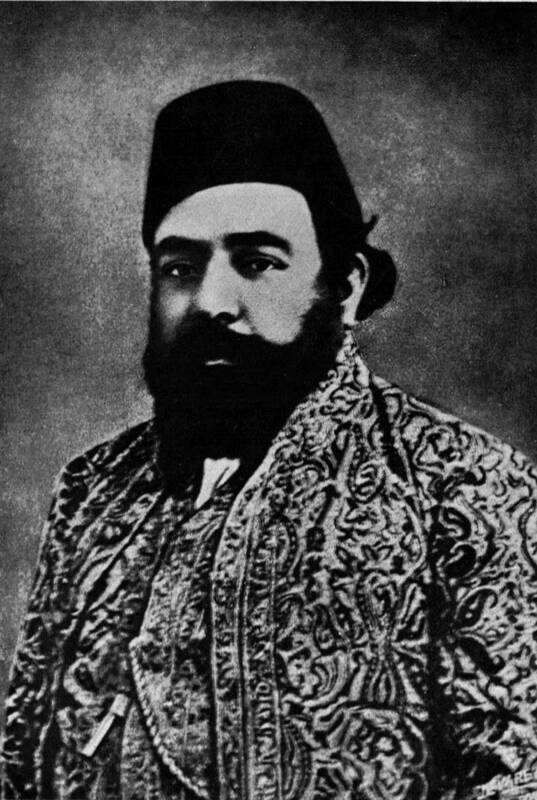 Imam Shah Ali Shah, Aga Khan II, was temporarily buried at Hasanabad before his body was moved to Najaf, Iraq, for a permanent burial. There is a smaller tomb for Pir Abul Hassan Shah. The chamber was used for morning Jamatkhana for many years. For a long period of time, a member would be seated outside the chamber for Phal to be read if anyone had the need . The main marble floor is often used on hot dry summer days for evening Jamatkhana congregation. Now there is a modern Jamatkhana in the grounds where regular daily gatherings take place, night and morning, on the first floor. The ground floor has a hall used for the meetings of scouts, guides and volunteers. A small hall behind is dedicated for religious training of children and young adults. The Gates at Hasanabad pictured in March 2011. Photo Credit: Mr. Shaukat Chandani. Normally, the grounds of Hasanabad is a haven for children who come there to play and visit the farm behind the mausoleum where one may buy fruits, especially Amra, which are very sour but loved by children. The farmers who look after the grounds and the farm live on the farm. We used to play cricket, football, gili danda and a variety of other games. On Sunday morning, there would be guides and scout meetings and we were encouraged to win as many medals as we could. The Hasanabad Boys Scout Group was quite popular in Mumbai and took part in many Jamborees and camps. We learned to cook on the campsite and to enjoy the burnt and half-cooked food with great relish, especially after tracking and building bridges. Between the Jamatkhana and the mausoleum there was a well, which has been shut for health reasons. Whenever Imam Sultan Mohamad Shah visited the Jamat, a stage would be set up beside the well for the orchestra. There would be a row of volunteers stationed outside to blow the whistle announcing the arrival of the Imam. There would be great flurry of activity as the Jamat gathered to sit on chatai reciting salwat whilst awaiting didar. As soon as the Imam entered the gates of Hasanabad, he would be received by the Mukhi/Kamadia and other leaders, with Major Lakhpati ready as ever with his umbrella. The jamat would be reciting the salwat, but there would be pin-drop silence as the Imam blessed the jamat with his hand and showered Khanavadan on all sides. Invariably, as he approached the stage, the orchestra would start the Ismaili Anthem and the Imam would then stop in front of the stage and very intently listen to the tune. When they had finished, he would shower the orchestra with Khanavadan. The hearts of all the musicians and conductor leapt with joy, with tears of happiness in their eyes. Slowly, the Imam would go up the stairs of the mausoleum and on reaching the top, he would turn around and again give Khanavadan and Bahot Dua Ashish before entering the chamber with only the Mukhi/Kamadia. After a few minutes he would emerge and again give Dua Ashish and Khanavadan. He would then undertake jamati ceremonies and those families who were registered for family mehmanis would have the opportunity of meeting the Imam and receiving his Dua Ashis and guidance. The Imam would bestow Farmans and then depart blessings the jamat with Khanavadan and Dua Ashish, whilst the ecstatic jamat happily recited the Salwat. As soon as he had left, the mikes would be blaring instructions, asking everyone to sit and maintain discipline and allow the Imam to leave without any disturbance. Once the Imam had parted, the Farmans would be translated into Gujarati and would be read out by a missionary. A similar schedule would be followed at the Aga Hall, Darkhana and Karimabad Jamatkhanas. If the padhramni happened on a school day, we were not allowed to attend. If it were on a Salgirah or another festive occasion, there would be fireworks and illuminations, mostly donated by the Morani family. 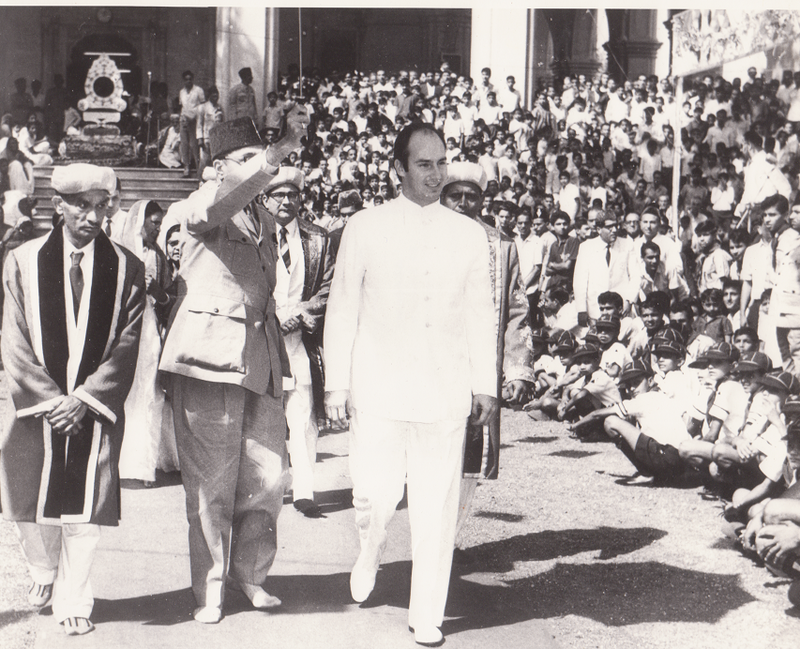 Mawlana Hazar Imam walks past the Jamat during his visit to Hasanabad, Mumbai, during one of his visits to India in the 1960’s. Holding an umbrella at centre is Major Ebrahim Patel. The Mukhi of Hasanabad, Hajibhai Nurmahomed, walks at left. Photo: Jehangir Merchant Collection. Next to the entrance of the Hasanabad grounds was a library with religious and other literature, and many of us also did our homework there. The rest of the ground had multiple buildings surrounded by small apartments occupied by Ismailis, often from villages. There were other locals who bought some of the apartments to live there. The gates of the historic Hasanabad protected the Ismailis during racial unrest and riots. The Ismaili volunteers would be watching any misdemeanours and the residents, or those who came for protection, felt very secure within the Hasanabad grounds. The police were always kept informed by those who helped to maintain peace. We did not feel any of the threats of World War II or poverty or racial tensions during the movements of Independence. Such was the security that Hasanabad offered us. Those were some of the happy days that I can recollect of Hasanabad. Date posted: September 21, 2011. About the writer: Aitmadi Dr. Aziz Rajabali Kurwa, MBBS FRCP(Edin.) FRCP(Lond. ), was born in Mumbai and got his education there up to his medical graduation. 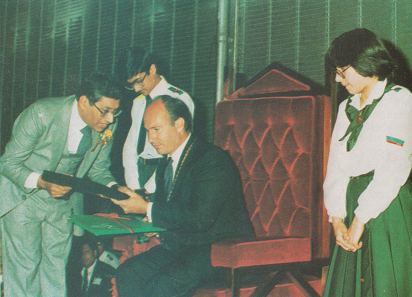 He became involved with services to the Ismaili community at a very young age. Dr. Kurwa arrived in England in 1958 with the sole ambition to be a consultant in the NHS. He became the Mukhi of the Birmingham Jamat in 1970, and together with the Kamadiani and other members of the Jamat assisted in settling many Ismailis who arrived in the Midlands area as refugees from Uganda. Olympia Hall, London, 1979: Mawlana Hazar Imam is seen receiving the report of the Ismailia Association’s activity and a set of Fatimid Gold Dinars from the President of the Association, Dr. Aziz Kurwa, the author of this article. The students Mukhi/Mukhiani are seen standing in a volunteers uniform. Photo: Ilm magazine. Later, after he relocated to London, England, he was appointed in 1979 by Mawlana Hazar Imam as the President of the Ismailia Association for the United Kingdom. He was also chosen by His Highness to be one of the resident governors of the Institute of Ismaili Studies, which he proudly served from 1986 until 1995. A true visionary, as Ismailia Association’s chief, Dr. Kurwa developed the concept of Baitul Ilm during the Silver Jubilee of Mawlana Hazar Imam, which to this day continues to have a tremendous impact on the U.K. Jamat. He contributed also to creating the Health Care Professional’s Association and reviving the Ismaili Seniors Club. His continued interest in Baitul Ilm led him to organise poetry sessions for Ismaili children and seniors, the success of which led to the Festival of Poetic Expressions as a Golden Jubilee programme. Dr. Kurwa and his wife, Aitmadibanu Shirin Aziz Kurwa, continue to reside in London. Volunteering at the Dawn of the Age of Imamat (“I Wish I’d Been There” series). We invite your contribution for the Jamatkhana series. Please click on The Jamatkhana: A Place of Spiritual and Social Convergence to read about the series and links to more Jamatkhana pieces. Thank you all for putting your words which gives us some information of the past. Can I get some information on Pir Shahabud-din Shah and where is his dargah located. I agree with Salim Currimbhoy. I remember the paghri was falling off, and mawlabapa held it in hand and handed it over to someone. The gold was falling short and the jamat was worried and Pir Sabzalli was looking for ladies to come to rescue. They plunged with love. The weighing was over. What a remarkable day. Thanks for this great article. I had heard about the Jubilees from the elders in my family. Reading this article brings back memories and deep emotions. I wish i was there with you. May Mawla always bless us. I am wondering if anyone knows the individuals who were responsible for undertaking the building of this Jamatkhhana. My father passed away last Saturday on June 2nd on the occasion of Yaum-e-Ali. He was born in Hasanabad, India, in Machiwala Family. At the age of 8 or 9 years, his parents passed away and my father then migrated to Pakistan. He used to say that Hasanabad was built by his father and grandfather. I would be interested in verifying the story. My grandfather’s and great grandfather’s names were respectively Hassan Ali Machiwala and Ismail Hassan Ali Machiwala. Dr. Kurwa – if you know anything then please do share it with me. Thank you for sharing the valuable information. Greatly appreciated. When I visit India, I will definitely visit Hassanabad Jamatkhana, and the town. Thank you all for being so kind as to share your thoughts. Your views brings much us closer even if we now live in far away places. If any of you visit London please make it a point to let me know so we can meet and know each other. This confirms my personal view that Jamatkhanas remain a focus in our lives and can serve to bring us close together. Gulshan, I have vague memories about your family. Chunara Press in Bombay was very devoted to reporting Jamati Events. They very happily published my contribution through Ismailia Students Education Society which I reviewed and of the First Arts and Crafts Exhbition opened by H.S.H Prince Aly Khan and my first photo with Mawlana Hazar Imam when He made a Paddhramni in London (Palace Gate) in 1958. There are many memories of Darkhana in Dongri and I am sure someone who lived there will pick up your message and write their experiences. Same for other Jamatkhanas. See how writing reminds us all as to who we are and how we got where we are now. Thank you Dr. Kurwa for writing such an interesting article and posting nice pictures. I have very good memories of Bombay. I used to visit all the Jamatkhanas in Bombay and remember visiting Hasanabad Jamatkhana, beautiful memories. Many small towns and villages in Maharashtra have Ismailis, and have small Jamatkhanas and they blend very nicely with the local Hindu community. My family and I have fond recollections of our visit to a small town called Bramhapuri in Chandrapur District near Nagpur, where my Mamu (Kamruddin Panjwani) used to be the Mukhi Saheb of thirty or so Ismailis – a small but very united Jamat, very respected group of people. Hindus, especially Gujaratis, treat us very well in small towns in Maharashtra. My Mamu’s best friends were Brahmins. Next to Bramhapuri was another small town in Central Maharashtra called Naghbhir with sixty Ismailis and all from the same family (my Mamu’s inlaws). Gondia is another moderate size town (my ancestral town), my grandfather (Musa Waliany) was well known there for his Biri and Building business. It has a beautiful Jamatkhana and much larger size Ismaili population. Gondia used to have an annual three day Majlis (I don’t know if they still have it). Ismailis used to come from different parts of Maharasthra. There used to be a gathering of about 5000 Ismailis. The majlis also served as “a match making event.” Girls and Boys would meet on day one of Majlis, and families would do the negotiation on Day 2, and on Day 3 they would get married! It was a mass marriage, about sixty marriages per Majlis. Our life there centred around Jamatkhana, and now here in Western world we got immersed in careers and strong work ethics. It is occasionally good to travel in memory lane. Thank again Dr. Kurwa for your time and effort. I would love to see pictures of Dongri (Darkhana) and the jamatkhana in Kandhimohalla. It is wonderful. I have visited Hasanabad Jamatkhana quite afew times. It is very nice to know about the Hasanabad Jamatkhana in Mumbai. This is the first that I read about the place in more detail. Thank you for the nice contribution and posting. Best Regards. Wonderful. I am very happy to read and remember the many many times we had Didars at Hasanabad. Dr. Kurwa has revived old time memories. With prayers, Sherali Shivji. Thank you for sharing this article with us. I grew up sovaplaying on the Hasanabad parthar. We lived in Andheri, and every now and then during the week end it was “chalo hasanasabad”. I am so surprised to see the front so clean and the new Jamatkhanam so well merged in architecture with the original monument. Alhamdolillah “this is truly the fusion of belief and archtecture”. When I go to India in the near future I will definitely visit Hasanabad, inshallah, amen. Thank you again. Zainub. Dr. Kurwa – we shall all benefit from your wonderful memories from the past about Hasanabad and the many historical events that took place there so many decades ago. Thank you for your fine piece. An excellent posting Dr. Kurwa! I had heard much about the Jubilees from the elders in my family…your article aroused in me emotions of love, joy, devotion and jubilation. Thank you for sharing your memories about Hasanabad Jamatkhana and the Jubilees. I was born and raised in Mumbai, and this article by Dr. Kurwa brings back the memories of Mumbai as well as Hasanabad. Good work, Simerg. Aziz: You have always served the Imam well. It was a great pleasure working with you during the Foundation Ceremony of The Ismaili Centre. You have been blessed to serve Mawlana Hazar Imam. May Mawla be with you always. Thank you for posting this wonderful and interesting article by Dr. Aziz Kurwa. I visited Hasanabad Jamatkhana in 1994 with my Dad and my elder brother. It was a very interesting trip. Reading this article brings back lovely memories and emotions! Excellent work! May Mowla always bless you and accept all your seva! Thank you very much for posting Dr. Aziz Kurwa’s wonderful article and photos which covered some significant events at Hasanabad. The Jamat has progressed tremendously in all spheres through the guiance of the previous and current Imams. A new generation is growing with excellent education. Our institutions and Jamatkahanas as well as the new Ismaili Centres provide us with the means to develop ourselves both materially and spiritually. The Imam’s vision continues to guide us into the future, and he is the pillar of progress. Shukhran for the guidance we have. A great article! I was a little boy about 8 years old with faint memories of Hasanabad, a grand jamatkhana for us kids. We used to look forward to playing with friends and having wide open spaces to run around in. Reading this article brings to life some of the faint memories and the remarkable detail portrayed raises deep emotions. Would love to see an article on the Garden Jamatkhana in Karachi. I was also a teenager in 1946 residing in Calcutta and had gone to Bombay for Imam Sultan Mohamed Shah’s Diamond Jubilee. I clearly remember the ceremony in the Brabourne Stadium and watched the procession from opposite the Law Courts and saw Imam Sultan Mohamed Shah in the balcony clapping and waving to the crowd. Thanks Aziz for a very interesting presentation. My father was appointed a trustee of the Diamond Jubilee Trust by Imam Sultan Mohamed Shah at that time. Aziz, reading this most interesting past made me feel that I wish I was there with you. Well done and may Allah bless you for all your past and present services, Ameen.